Category: Breeding Accessories. Tag: Butterfly Enclosure. 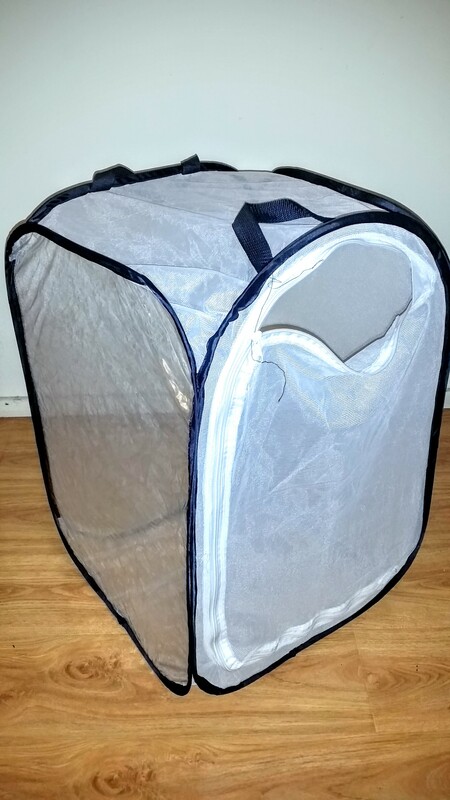 Folding Pop-Up Butterfly Enclosure measures 36x36x60cm. It features ant proof mesh walls with one wall made of transparent plastic to help to observe your caterpillars, butterflies or other invertebrates like stick insects and lady beetles. The front opens fully with a zip for easy access or for when butterflies need to be released. The top has two carry handles. The butterfly enclosure is durable and can be washed and stored away to be used again year after year. Up to 10 butterflies can be kept in the Pop Up Butterfly Enclosure for 3-5 weeks, you just need to feed them. To feed butterflies, soak a paper towel in sugary water (1-2 teaspoons of sugar per glass of water) and place it on top of the enclosure. Butterflies are attracted to light and often hang out at the top of the enclosure. This is where you place your paper towel. You can also put one at the bottom of the cage, just in case. Additionally, mist the mesh of your enclosure daily with clean water to keep the butterflies hydrated. The pop-up enclosure folds back into a 20cm disk.